Celebrating a decade since the launch of the first Gal­axy S, Samsung Electronics Co., Ltd. introduces a new range of premium smartphones: Galaxy S10. With three unique devices, the Galaxy S10 range is engineered to meet the distinct needs of today’s smartphone market, so consumers can do more of what they love. Each device delivers ground­breaking innovations in the cate­gories consumers care about most: display, camera and performance. The Galaxy S10, Galaxy S10+ and Galaxy S10e is available in Voda­fone stores and online since March 8. Listen to your favorite music on the go, and up your fitness game, when you get your hands on the Galaxy S10 before anyone else. As testament to a decade of inno­vations, Galaxy S10 is designed for those who want a premium smart­phone with powerful performance and sets the stage for the next gen­eration of mobile experiences. For consumers looking for a su­percharged device, Galaxy S10+ takes every specification – from display, to camera, to performance – to the next level. Galaxy S10e is built for those who want all the pre­mium essentials in a compact pack­age. Featuring the all new Dynamic AMOLED display, next-generation camera, and intelligent perfor­mance, the Galaxy S10 line offers consumers more choices and sets a new standard for the smartphone. “Since its launch 10 years ago, the Galaxy S series has stood for pre­mium innovation – offering con­sumers an incredible experience, and the ability to find the device that’s right for them,” said DJ Koh, president and chief executive of­ficer of Information Technology & Mobile Communications Division, Samsung Electronics. “Galaxy S10 builds on that incred­ible legacy, and delivers break­through display, camera, and per­formance innovations. Galaxy S10 is made with Sam­sung’s best screen yet, the world’s first Dynamic AMOLED display. As the first HDR10+certified smart­phone, the display delivers vivid digital content, and with dynamic tone mapping, you’ll see a wider range of colour for a brilliant, real­istic picture. Galaxy S10’s Dynamic AMOLED display is also VDE-certified for vi­brant bright colours and the indus­try’s best contrast ratio on a mobile device for even deeper blacks and brighter whites. Verified by DisplayMate, you’ll also enjoy the world’s most accu­rate colours on a mobile device– even in harsh sunlight. What’s more, the Dynamic AMOLED display also reduces blue light through its TÜV Rheinland-certified Eye Comfort display with­out compromising picture quality or adding a filter. As a result of a groundbreaking engineering process, Galaxy S10 packs an array of sensors and cam­era technology into its Infinity-O Display – to maximise screen real estate while minimising distrac­tions. 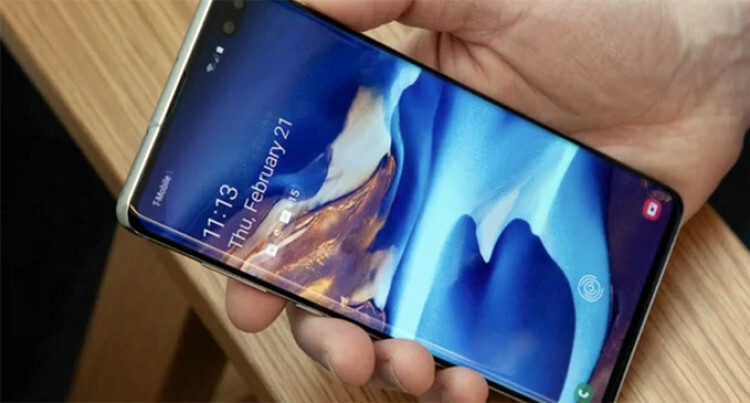 Galaxy S10’s Dynamic AMOLED display also includes the first-ever embedded Ultrasonic Fingerprint Scanner that reads the 3D contours of your physical thumbprint, not a 2D image of it – for accurate and in­tuitive security. With the world’s first FIDO Alli­ance Biometric Component cer­tification, this next generation biometrics authentication offers vault-like security to keep your de­vice safe. Wide Lens with a 123-degree field of view, better than the human eye, so the frame captures what you see plus more. Perfect for impressive landscape shots, big panoramas and even fit­ting the entire extended family into the photo, the Ultra-Wide Lens en­sures that you’ll always be able to capture the full scene. Galaxy S10 offers Super Steady recording with digital stabilisation technology. Whether you’re dancing in the middle of an amazing concert or trying to record every detail of a bumpy bike ride, Super Steady al­lows you to capture the moment. Both front and rear cameras can shoot in up-to UHD quality, and in an industry first, the rear camera gives you the flexibility to record in HDR10+. Galaxy S10 makes already smart features more accurate with a Neu­ral Processing Unit (NPU) so you can get pro-grade shots worth shar­ing without having to manually se­lect any advanced camera settings. Scene Optimiser can now recog­nise and more accurately process additional scenes because of the NPU. With Shot Suggestion, Galaxy S10 also offers automatic composition recommendations so you can frame your photo better than ever. Galaxy S10 is built with premium hardware and machine-learning-based software that works hard, so you don’t have to. From brand new power sharing capabilities to AI-powered perfor­mance enhancement and Intel­ligent Wi-Fi, Galaxy S10 is Sam­sung’s most intelligent device yet, from the inside out. Samsung introduces Wireless PowerShare on Galaxy S10, mak­ing it possible to easily charge Qi-certified devices. As an industry-first, Galaxy S10’s Wireless PowerShare will also charge compatible wearable de­vices. In addition, while connected to a regular charger, Galaxy S10 is capa­ble of charging itself while simul­taneously charging a second device via Wireless PowerShare, enabling you to leave your second charger at home while on a trip. The new AI software on the Gal­axy S10 automatically optimises battery, CPU, RAM, and even device temperature based on how you use your phone, and continues to learn and get better over time. Leveraging AI-capabilities, Gal­axy S10 also learns how you use your device to launch your most frequently used apps faster. Galaxy S10 comes with Intelli­gent Wi-Fi that allows for an un­interrupted and safe connection by seamlessly switching between Wi-Fi and LTE, as well as alerting you of potentially risky Wi-Fi con­nections. Galaxy S10 is also Wi-Fi 6 ready, making it possible for better Wi-Fi performance when connected to a compatible router. On Galaxy S10, Bixby automates your routines and provides person­alised recommendations to make your life easier. With pre-set and personalised rou­tines, such as driving and before bed routines, which are customised based on your habits, Galaxy S10 makes things simpler by automati­cally reducing device touches and cutting steps out of your day.